It deeply penetrates to purify your pores of acne-causing bacteria. It provides appropriate and lasting treatments for acne scars caused by both cystic and hormonal acne. It helps clear your skin of all forms of blemishes including blackheads and whiteheads. It enhances your skin tone and makes your skin glow. Keeva Acne Cream – Does It Really Work? Does Keeva Acne Cream Have Any Side Effects? This product’s key ingredient, tea tree oil, is widely considered as the natural counterpart of benzoyl peroxide for clearing up acne-challenged skin. In addition to drawing out acne-causing bacteria, tea tree oil also helps regulated excess sebum to make your oily skin less prone to infection. The addition of salicylic acid enables this cream to speed up exfoliation to remove dead skin cells and allow a new layer to surface. Tea Tree Oil: It has natural antiseptic properties that rids your skin of acne-causing bacteria. 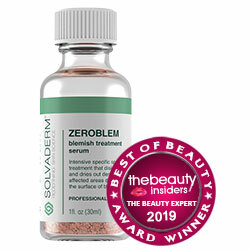 Salicylic Acid: It delivers a light exfoliating action that eliminates dead skin cells and speeds up skin regeneration. White Willow Extract: A natural source of salicylic acid, this helps turnover skin faster. Vitamin E: It helps replenish lost moisture and supports skin repair. Rosehip Seed Oil: It improves your skin’s structure to promote healthier skin that is more resilient to damage. Grape Seed Extract: Boosts your skin’s antioxidant levels to improve damage protection functions. Use as a spot corrector. Apply cream only on affected areas of your skin. Use twice daily on freshly cleansed skin for best results. This product suits the vegan lifestyle, does not use ingredients derived from GMOs and is soy-free. This acne treatment solution is manufactured in the USA. Huge discounts are available for bulk purchases. Based on user reviews, this product may affect different people differently. Skin improvements may not be immediate and take time to take effect on skin. This product appears to have a limited distribution network and may not be available in all territories. Some ingredients, including botanical ingredients, salicylic acid and menthol, which this product is formulated with may cause irritations and allergic reactions in some people. Phenoxyethanol, used in this product as a preservative, is a well-known neurotoxin. People who are acne-challenged often have more sensitive and reactive skin. This product offers a potentially less irritating formula that these skin types may be able to tolerate better. Although, there are no guarantees that this product will work without causing skin irritations since there are still ingredients in there that are well known to agitate skin. 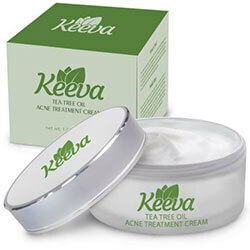 In any case, it is best to compare Keeva Acne Cream with another similar product before you try. What is the Price of Keeva Acne Cream? A 1 oz. jar of this product costs $39.95 although more than 30% discount is typically applied on purchases made via the product website. Where to buy Keeva Acne Cream? This cream may be purchased through the product website. Exclusive discounts are available for bulk orders. Does the Keeva Acne Cream come with money back guarantee? Yes, all purchases are covered by a 30-day money back guarantee. Is Keeva Acne Cream approved by the FDA? Products like this do not require FDA approval. The manufacturer is not compelled to present evidence of product efficacy. Who Should Use Keeva Acne Cream? This product is for people who suffer from acne or who have acne marks, and are longing for a clearer, blemish-free skin. This product may also help people with sensitive skin obtain treatment for their acne problem. Should I use the Keeva Acne Cream once or twice daily? For best results, apply this cream over affected areas twice daily. Apply product on freshly cleansed skin only. How long does one bottle of Keeva Acne Cream last? Since this product is recommended to be used as a spot treatment, how long it will last depends on how mild or severe your acne is, and how much area is affected. How long will results last? Results depend on how well your skin responds to this product, and can possibly be lasting. Can I use the Keeva Acne Cream with makeup? Yes, use under makeup. After cleansing and toning, apply this product on affected areas of your skin. Allow the product to become completely absorbed before layering with your concealer and foundation.